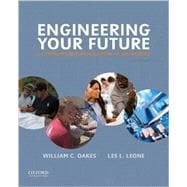 by Oakes, William C.; Leone, Les L.
Engineering Your Future: A Comprehensive Introduction to Engineering, Ninth Edition, is an authoritative guide to the academic expectations and professional opportunities in engineering, a field that is both academically rigorous and creatively demanding. Today's engineering students are faced with endless career opportunities. Engineering Your Future clarifies those options and directs students down the path to a rewarding career in the engineering field. Featuring exceptionally broad coverage, it offers instructors unparalleled flexibility for any introductory course. William C. Oakes, P.E., is Professor of Engineering Education and Director of the EPICS Program at Purdue University. He is also the coauthor of Service-Learning: Engineering in Your Community, Second Edition (OUP, 2013) and a Fellow of the American Society for Engineering Education and the National Society of Professional Engineers. Les L. Leone is Assistant Dean Emeritus at the College of Engineering at Michigan State University. He is the recipient of numerous honors and awards from the American Society for Engineering Education. 10.5 What Makes a Successful Team? 12.1 What Is Engineering Design? 19.7 Which Is Best for You? 20.2 Why Study Liberal Arts?